three + 3 = Required Please enter the correct value. Oil prices tumbled below the $30 mark today (Tuesday) after a bearish report from the International Energy Agency (IEA) sent investors running for the hills. 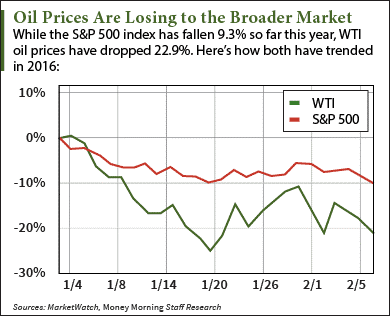 But there's one crucial reason why crude oil will stage a rebound in 2016. In fact, a $600 million signal flashed last week that clearly shows prices are about to see long-term gains. At 9:05 a.m., West Texas Intermediate (WTI) crude oil prices were down 0.8% and trading at $29.44 a barrel. The U.S. benchmark continued its second straight day of losses following Monday's 3.9% drop. Futures for March delivery are now down 12.4% in February and 22.9% in 2016. Brent crude oil prices saw similar losses this morning. The global benchmark – priced in London – fell 0.8% to $32.61 a barrel. Futures for April delivery are down 9.4% this month and 15.4% this year. Today's decline came after the release of the IEA's monthly oil market report. The agency forecasts annual oil demand growth will remain below 1.2% due to increasing OPEC production. The cartel's output rose by 280,000 barrels to 32.6 million last month. That was mostly due to Iran's output, which saw an 80,000-barrel boost due to the country's recently lifted economic sanctions. The report ruined hopes that countries both in and outside the cartel would work together to reduce global oversupply. After all, rumors concerning a deal between Saudi Arabia and Russia to cut supply have been swirling since the start of the year. "Persistent speculation about a deal between OPEC and leading non-OPEC producers to cut output appears to be just that: speculation," the IEA said in the report. Now many pundits are pointing to these Saudi-Russia rumors as a reason that oil prices could climb to $50. But Money Morning Global Energy Strategist Dr. Kent Moors – a 40-year veteran of the energy industry who's advised the highest levels of U.S. and Russian governments – says that argument is too short-sighted. On Feb. 2, $600 million worth of shares of the VelocityShares 3X Inverse Crude Oil ETN (NYSE Arca: DWTI) were sold. 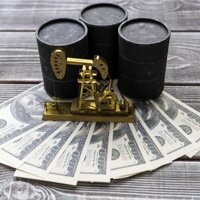 You see, this exchange-traded note (ETN) – which is a cross between an exchange-traded fund (ETF) and a bond – provides a three-time inverse return to WTI oil prices. In other words, when prices fall, shares of DWTI increase by three times as much. The $600 million sell-off became the largest coordinated ETN withdrawal ever and boosted WTI oil prices by 8%. The historic decline in DWTI and huge boost in oil prices showed how artificial moves affect day-to-day prices. But more importantly, it demonstrated how investors are confident the oil price crash is ending. "Whatever else is happening, these players have clearly concluded the decline in oil is over," Moors explained on Feb. 5. "That shows just how undersold the oil market has been, and the force behind oil's upward pressure now that some of these artificial moves to keep oil down are lifting." The Bottom Line: With oil prices below $30 again, investors fear the market may never recover. The sell-off seems endless as demand growth stagnates and hopes of production cuts quickly fade. But last week's $600 million sell-off in DWTI is the only reason you need to stay bullish on oil prices in 2016. The mass exodus shows that savvy investors believe oil prices are about to stabilize and begin their long-term rebound.